I perform and teach acoustic, and electric guitar. I play mostly blues,jazz, and rock music. I can perform at weddings, formal and casual events, parties, work or private functions. I have been playing for 20 years, teaching for 15, I've performed all over the country and studied with some of the best teachers in the country in high school and college. I also have a 3 piece blues/rock band called Tres Locos. Beautiful music ranging from classical to rock to blues to jazz, or whichever style of music is requested for the performance. An overall great time is always had. I have been playing guitar for 24 years. I toured and performed all over the country. I studied classical guitar at BTW Magnet High School in Montgomery,Al; Huntingdon College in Montgomery,Al & also at Calhoun Community College in Decatur,Al. I won the Ada N. Moss award at Calhoun for the most outstanding student in music. I have also been teaching off and on for about 15 years. 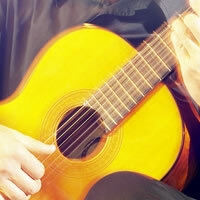 I can play all styles of music and am well versed in acoustic, classical, and electric guitar formats. I also have an acoustic blues duo called Duos Locos and a 3 piece blues/rock trio called Tres Locos and we perform and record on a regular basis. All I require is a comfortable chair, and a basic PA, power amp, mixer, microphone, mic stand and cables. I can play my own original music or any music by any artist that is requested of me in advance for the performance. Pepe Romero, Segovia, John Williams, BB King, Eric Clapton, Antoine Dufour, Leo Kottke, The Allman Brothers, Stanley Jordan, and many many more. PA system(basic set up), power amp, mixer, microphone, mic stand, cables, comfortable chair.